The Bulls head into one of the toughest places to play in the league on Thursday evening as they take on the Thunder in primetime. Oklahoma City boasts the best record in the league at 20-4 and is currently riding a season-high and league-high eight-game win streak. They are averaging over 110 points per game during this stretch while shooting 50.1 from the field. They are also the only team in the league that has yet to lose a game on their home floor. They are a perfect 12-0 at Chesapeake Energy Arena. OKC also has one of the best one-two combos in the league in Russell Westbrook and Kevin Durant. Both have to be considered early-season MVP candidates, and were key in the Thunder’s 105-93 win at Denver on Tuesday. Durant scored 30 points while Westbrook added 21 points, 12 rebounds and eight assists. For the Bulls, it has been an up and down season. 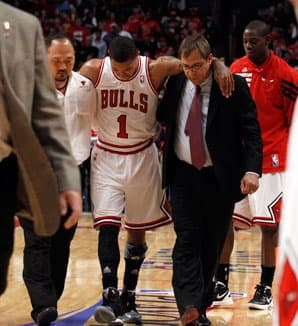 The team suffered an enormous loss by losing point guard Derek Rose for the rest of the year with yet again another knee injury. Since Rose went down with injury, Chicago has gone 3-9. They have been even worse over their last half-dozen or so games, losing six of seven and averaging less than 82 points per contest. Their offense faded once again on Wednesday’s 109-94 loss at Houston, where the Rockets put the game away with a 15-1 run at the start of the fourth. An experienced team like the Bulls is tough to layoff, especially when they are getting nearly 13 points, but I think this spot is much better for the Thunder. Not only are the Bulls coming off a game last night, their inability to score presents a massive problem against one of the highest scoring teams in the league. Chicago is a much older team, and will not be able to keep pace with the much younger Thunder, especially with tired legs. The Bulls look like a team that has given up. I would not be shocked to see this team dismantled at the deadline. A finally healthy Golden State Warriors welcome the Spurs to town in what could be a playoff preview once the dust settles in the West. After being highly touted in the preseason, the Warriors dropped nine of out their last 14 games before beating New Orleans 104-93 on Tuesday. Curry led the way with 28 points and 12 assists while David Lee added 21 in the contest. The win put them two games over .500 at 14-12. The game also marked the return of Andre Igoudala, who played just 17 minutes after missing 12 games with a hamstring injury. He had just two points in the game, but his health will be paramount to their success this year. Before his injury, he was on pace for one his best statistical seasons. He had been shooting 53.5 percent, compared to his career percentage of 46.1. Only the Thunder have a better record than the Spurs this season, but they will be without All-Star point guard Tony Parker in tonight’s contest. Still, at 20-5, the San Antonio is more than able to win games without him. They lost their first contest without Parker 115-92 at the Clippers but rebounded two days later with a 108-101 win at Phoenix. Manu Ginobili scored a season-high 24 points in the win, and the ageless Tim Duncan added 17 points and 13 rebounds. This is another situation where an older team is coming off a back-to-back, and it is another spot I am favoring the younger, albeit less experienced Warriors. Golden State is one of the toughest teams to face after playing a game the night before and Parker’s absence will be especially significant against the up-tempo Warriors.